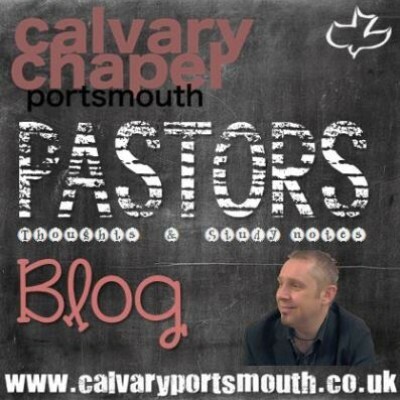 On Sunday morning we were looking at the last two of seven characters introduced to us in chapters 12 & 13 (If you haven’t already noticed, the book of Revelation is arranged around groups of 7). In chapter twelve we were introduced to 1) the Woman, who we saw was ‘mystical Eve’ carrying the line down through the ages from Eve in the garden of Eden, to Mary. We also saw 2) the Manchild – Jesus Christ who will rule all nations with a rod of iron. Fighting on behalf of Israel we saw 3) the archangel Michael, and in defiance to all that is true and holy we saw 4) the dragon, identified as Satan. The 5th ‘person’ we were introduced to was the ‘saints’ who Satan will turn to attach once Israel is fled for safety and protection in the wilderness of Edom. So that brings us to this chapter, and we are firstly introduced to 6) a beast that John sees coming out of the sea. This beast is to be the final world government of this age, before Jesus returns and ‘puts down all authority and power (1 Cor 15:24). The final character is then revealed as a beast from the earth, who will be the embodiment of false religion, who is later identified as the False Prophet. From the beginning Satan has been a deceiver and master counterfeiter. Now, at the mid-point of the Tribulation, Satan (man’s great opponent) will attempt to deceive mankind through an unholy trinity, with Satan (as he has always wanted) being ‘like God’; Antichrist (as the name means) ‘in the place of Christ’, and the False Prophet assuming a Holy Spirit-like role, pointing people to the false Christ. As we noted in the introduction to chapter 12, Satan thought all of creation was to be his. But then God created man in His own image and gave Adam dominion over all the earth (Gen 1:26). Infuriated, Satan’s pride caused him to fall (1 Tim 3:6), and he then immediately set about deceiving man in order to wrest the dominion of earth from him. Satan is, for now, ‘the god of this world’ (2 Cor 4:4). Since then, Satan has been ‘hell-bent’ on the destruction of man with just one agenda; viz. to be worshiped, whether knowingly or unwittingly. He is equally happy with those who foolishly play with the occult, Ouija boards, tarot cards, horoscopes, yoga, eastern mysticism and other false religions, or with those who just worship materialism, thinking they are free from religion following their own (Satan-inspired) human natures, with a ‘if it feels good do it’ mentality, blissfully unaware of the consequences of their hedonism. Here we have a created angel asking the Creator to worship him! Talk about delusions of grandeur! An important point to note in the above verses is that Jesus doesn’t challenge Satan’s claim to be able to give Him the kingdoms of the world, for as already mentioned, for now they do belong to Satan. However, as we have been seeing in our study, in Revelation chapter 5 Jesus was found worthy to reclaim that which Adam lost. From chapter 6 we then see all creation getting ready for a change of ownership! This concludes in chapter 10 when the mighty angel declares that ‘time is up’ (10:6), which is then followed by the triumphant declaration that: “The kingdoms of this world are become the kingdoms of our Lord, and of his Christ; and he shall reign for ever and ever” (Rev 11:15). Whilst God has of course always been in ultimate control, He has allowed Satan, who for now possesses the title deed to the earth, to manipulate the kings and kingdoms of this world (Luke 4:6). Each world empire throughout history has had its own unique traits; Babylon (which spawned almost all false religion) had its idolatry and pride; Medo-Persia had brutish strength; Greece conquered the world with lightning speed, and Rome crushed all in its way. However, as we will see in this chapter, the Bible teaches that there is another world empire on the horizon that will encompass and eclipse all of the previous empires put together. Nebuchadnezzar’s dream of a large statue made from different materials laid out the entire history of the world kingdoms, from the time of Daniel (Babylon as the head of gold) until the time of the final Satanic world kingdom (the iron mixed with clay). It is that final kingdom that we will see introduced in Revelation chapter 13. However, that will not be the end, for Daniel also records that following this attempt by Satan to eradicate Christians, destroy Israel, rule the world and to be worshipped by all mankind, Jesus will return! “And in the days of these kings shall the God of heaven set up a kingdom, which shall never be destroyed: and the kingdom shall not be left to other people, but it shall break in pieces and consume all these kingdoms, and it shall stand for ever.” (Dan 2:44) – that is why we are told to pray ‘Thy kingdom come…on Earth!’ (Matthew 6:10). In Daniel’s interpretation of king Nebuchadnezzar’s dream he told the king: “You, O king…Thou art this head of gold. And after thee shall arise another kingdom inferior to thee. Exactly as Daniel had said, after the Babylonian kingdom (of which Nebuchadnezzar was the head), came the Medo-Persian Empire, which was powerful and subdued the Babylonians, Egyptians and the Libyans (North Africans); however, it did not become as powerful as Babylon in its prime …and another third kingdom of brass, which shall bear rule over all the earth. After the Medo-Persian Empire came the Greeks led by Alexander the Great, which swept across the world and conquered all before them …And the fourth kingdom shall be strong as iron: forasmuch as iron breaketh in pieces and subdueth all things: and as iron that breaketh all these, shall it break in pieces and bruise. Finally, the mighty Roman Empire came which did ‘crush in pieces and subdue all things’, as Daniel had prophesied. However, whereas all the other kingdoms were subdued by the succeeding one, the Roman Empire was never conquered, but rather broke apart with all the major parts taking their turn in ruling for a time …And whereas thou sawest the feet and toes, part of potters’ clay, and part of iron, the kingdom shall be divided; but there shall be in it of the strength of the iron, forasmuch as thou sawest the iron mixed with miry clay. And as the toes of the feet were part of iron, and part of clay, so the kingdom shall be partly strong, and partly broken (Dan 2:37-43). It is this divided kingdom, often spoken of by prophecy students as a ‘revived Roman empire’, that will be seen and explained further in Revelation chapter 13. However, before we get into our study of Revelation chapter 13, more insight is gleaned from Daniel chapter 7 where there is another vision of these world empires, but this time Daniel sees them as beasts. Regarding the forth kingdom, when Daniel receives the interpretation he is told: “The fourth beast shall be the fourth kingdom upon earth, which shall be diverse from all kingdoms, and shall devour the whole earth, and shall tread it down, and break it in pieces. This is historically true of the Roman Empire, but then we are told …And the ten horns out of this kingdom are ten kings that shall arise: and another shall rise after them; and he shall be diverse from the first, and he shall subdue three kings”. (Dan 7:23-24). Horns typically symbolize strength, so it is no surprise they are idiomatically used to depict kingdoms. As seen from the above verse, somehow, out of the old Roman empire will come a ten-kingdom world empire, but of which three ‘kings’ will fall before Antichrist (the ‘another’). Thus from these verses we can see that there is a phase of the Roman Empire that has yet to be fulfilled, where the Empire will once again come to power. 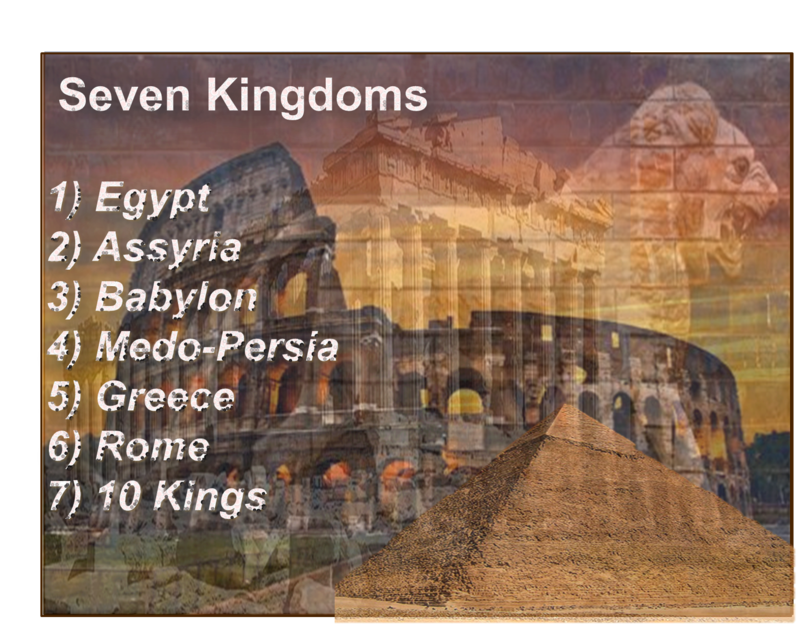 Out of this revived Roman Empire will then come 10 kings represented here by the ten toes (Daniel 2) and ten horns (Daniel 7/Rev 13). 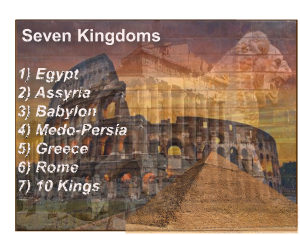 We are told that these 10 kingdoms will cover the whole world; or it might be that the world will be divided into 10 regions. It is interesting to note that the Club of Rome has already suggested that the world be sectioned into 10 ‘administrative districts’ with the intention of avoiding the potential of a world economic collapse. Antichrist (the little horn) will then arise and subdue three of these 10 kings taking total control of the nations of the earth, and thus we will be back to where it all started at the Tower of Babel with Cush and his son Nimrod – a one world government with Satan at the helm. This has been Satan’s plan since that time. With some background covered, we are ready to move into Revelation 13! 17 Then the dragon was angry with the woman, and went off to make war on the rest of her offspring, on those who keep the commandments of God and bear testimony to Jesus. And he stood on the sand of the sea. “And the dragon stood on the sand of the seashore” (NASB). We now are faced with an array of ‘signs’, just as we were in the opening of the last chapter. As we have already mentioned, signs point to something literal; our task is to find their meaning and of course, scripture itself will be our guide. The beast is synonymous with Satan and yet at the same time distinct from him as is clear from verse 2 & 4 (below) where we read that Satan gives his power to the beast. Clearly however, the beast has the attributes of Satan and we will discover that this is the beginning of Satan trying to establish a satanic trinity; we will explore this in more detail in verse 11-12. Thus the beast that John is seeing and recording in Revelation 13 is the same that Daniel saw 2500 years earlier. The beast is symbolic of both Antichrist and his kingdom, and in both John and Daniel’s visions we see him coming to power and establishing his throne on earth for 31/2 years (time, times & the dividing of time). In Rev 17:9-11 we read: And here is the mind which hath wisdom. The seven heads are seven mountains, on which the woman sitteth [we will deal with the ‘woman’ when we get to chapter 17] …And [they] are seven kings: five are fallen, and one is, and the other is not yet come; and when he cometh, he must continue a short space. And the beast that was, and is not, even he is the eighth, and is of the seven, and goeth into perdition. The mention of seven mountains has led some scholars to conclude that this passage is referring to the city of Rome because it is built on seven hills. However, whilst Rome is indeed alluded to (both politically and religiously) the scope of this prophecy is wider than just Rome. When mountains, are used symbolically in Scripture, they are always a symbol of a king or kingdom or throne; and we are clearly told in the text that the seven heads are seven mountains, which are in turn seven kingdoms. We are also told that at the time John is receiving this prophecy, five of the seven kings (kingdoms) have fallen, one is existing, and one is yet future. It is a matter of history that the Roman Empire was in power in John’s day and prior to that there had been five ‘world’ empires, starting with 1)Egypt, and going on to 2)Assyria, 3) Babylon, 4)Medo Persia and 5)Greece. Rome then became the sixth and we are now awaiting the emergence of the final world Empire which will start as a World Government, that will devour the whole earth; then it will be divided into 10 ‘kingdoms’ from which Antichrist will arise. Now we see that this beast has the attributes of the preceding world empires and is given Satan’s power and authority. In Daniel’s vision we read: “The first [beast] was like a lion [Babylon] and had eagle’s wings: I beheld till the wings thereof were plucked, and it was lifted up from the earth, and made stand upon the feet as a man, and a man’s heart was given to it. And behold another beast, a second, like to a bear [Medo-Persia], and it raised up itself on one side, and it had three ribs in the mouth of it between the teeth of it: and they said thus unto it, Arise, devour much flesh. After this I beheld, and lo another, like a leopard [Greece], which had upon the back of it four wings of a fowl; the beast had also four heads; and dominion was given to it. (Daniel 7:4-10). The heads represent the world empires, the ruler of the last will be Antichrist, and it is this ‘head’ that is ‘wounded to death’. How this will happen is unclear but somehow Antichrist will be wounded and appear to die. Some scholars think that he will actually die and raised to life again by the power of Satan; either way the effect will be the same because the world will believe that Antichrist has died and will then see him ‘miraculously brought back to life’. This will be one of the satanic signs that are performed to deceive the world and cause them to follow Antichrist. Your only safeguard against deception is the Word of God. For, lo, I will raise up a shepherd in the land, which shall not visit those that be cut off, neither shall seek the young one, nor heal that that is broken, nor feed that that standeth still: but he shall eat the flesh of the fat, and tear their claws in pieces. Woe to the idol shepherd that leaveth the flock! the sword shall be upon his arm, and upon his right eye: his arm shall be clean dried up, and his right eye shall be utterly darkened. Does this imply that his head wound will affect the use of his arm and the sight of his right eye? As a result of this deception, people will fall hook, line and sinker for the lie and will start to worship Satan who has given power to Antichrist; this will require all other religions to ‘fade away’. It is no coincidence that there is a massive world wide effort to unite all religions with the lie that we can all find our own path to ‘god’. One of the stated aims of the new Pope was to bring about a greater understanding between all religions. As a result of the atrocities committed by fundamentalist Muslims, mainstream Islam is now distancing itself from the fundamentalists and becoming more tolerant and open to other faiths in an attempt to stem the tide of anti-Islamic feeling. All of this will continue until there is one world religion (that will be headed up by the Roman Catholic church), we will deal with this in Revelation chapter 17. Eventually Antichrist will put an end to this false religious system and cause all to worship him, convincing them that he is their ‘Christ’ or ‘Mohammed’ or ‘Buddha’ etc. Satan’s sin was pride (1 Tim 3:6), which is seen here manifesting itself as arrogance as he (through Antichrist) keeps opening his mouth and speaking against the God of Heaven. Again we have confirmed that his ‘moment of glory’ will only last for 42 months (31/2 years). It is really hard to imagine the twisted arrogance that would cause a created being to speak against its Creator. Those who dwell in Heaven (no doubt including the Church) are also the subject of the malicious lies and insults. As we have already mentioned these saints cannot be the Church because we are told in Matthew 16:18 that: “I will build my church; and the gates of hell shall not prevail against it” These saints will be those who come to faith during the tribulation (probably through the preaching of the two witnesses and the 144,000 Jewish evangelists). Although they are called saints they are not part of the Church – which will be complete at the time of the Rapture. ‘Saints’ is simply a term that refers to God’s people whether they be Jews, Christians or Tribulation Saints. There are just two groups of people as described by Paul in the book of Romans; those who are saved and those who are perishing. That is what we see here; either your name is in the book of life and you are saved or it is not and you will end up worshipping Antichrist. The fact that it is predestined (decided) before the foundation of the world does not relieve us of our responsibility or make God unjust by deciding people’s fate for them; it simply shows that because God is outside of time, He knew the choice and decision that you are going to make in regard to your relationship with Him. Either you will accept or reject the way out that He has made through the death of His Son in your place. We all have free choice and our eternity will depend on what we do with that freedom to choose. One consolation for the believers during this time is that whoever harms them will be harmed in the same way. Nevertheless it is still going to be a really tough time for believers and it may well be that the only way out of this time will to be martyred (killed) for their faith. How much easier and rewarding it is to believe now and become a part of the Church! If you are reading this and you are not part of Jesus Christ’s Church, don’t leave it a moment longer. Repent (of your sin – that means turn away from it, literally going in the other direction), believe (that Jesus is Lord and that God raised Him from the dead) and receive the free gift of the Holy Spirit as a guarantee that you are now safe in His hands. If you would rather ‘sit it out’ and decide later, then what we are reading about in this verse is what you have in store – provided that you are not deceived first. Now we are introduced to a second beast. Two is the number of witness or testimony and being like a lamb he is trying to deceive by appearing to be like the true Lamb of God. However when he opens his mouth we are no longer in any doubt where he is coming from. So here we have the completion of the Satanic trinity. Satan as (an extremely poor copy of) God the Father, Antichrist as the name literally means, ‘in stead of Christ’, and now the False Prophet (as he is called in Rev 19:20) as a type of the Holy Spirit; and as the Holy Spirit doesn’t take the praise but always points to Jesus, so the false prophet will seek to exalt and glorify Antichrist, causing all to worship him. The people of the earth had seen God’s two witnesses call down fire from Heaven on any that tried to harm them; Satan now gives this power to the false prophet as if to counter what God has done. This reminds us of Pharaohs magicians in Egypt who tied to counter the signs that Moses and Aaron did in an attempt to harden the people’s hearts. We now see the ‘real thing’ for which king Nebuchadnezzar’s statue was a dress rehearsal. The false prophet will deceive the people (who have made this world their home) by the ‘signs and wonders’ and then he’ll suggest that they make an image of Antichrist. Somehow the false prophet will make the image of Antichrist (which will be placed in the Holy of Holies in the temple in Jerusalem) to seem as if it’s alive and even cause it to talk. Just like it was with king Neb’ back in Daniel 3, any that don’t worship the image will be killed. All really does mean all: the ordinary folks & the famous celebrities, rich & poor, employers & employees; all will be made to receive a mark in either their right hand or forehead. Everyone will have to receive the mark and buying or selling will be made impossible unless you have either the mark, or Antichrist’s name, or the number of his name. In this way everyone will be forced to pledge allegiance to Antichrist. Whilst some sort of electronic microchip may well be used during this time, the mark is unlikely to be your own personal ID number (such as you currently have with your Credit Card number), because the whole point of this is that you are given Antichrist’s number. Whatever the mark will be it will also probably be visible; again, it is an outward sign that a person has pledged their allegiance to Antichrist. This is also another one of Satan’s poor copies, because back in chapter 7 the servants of God were marked in their foreheads with the name of God (this is confirmed in the next chapter also). This is written for those on earth during this time who will be able to identify Antichrist by adding up the letters in his name which in the Hebrew or Greek will add up to 666. Many fruitless hours have been wasted by people who have tried to figure this out before the time. In 2 Thessalonians we are told that Antichrist is being held back until the Church has gone.